September 15, 2011, Taipei, Taiwan – The amazing new VIPER case from a leading PC chassis maker, RAIDMAX, combines ease-of-use and technical excellence with stunning good looks. The VIPER offers PC builders easy access and tool-free installation, advanced cable management, and a unique design with a choice of three colors. Incorporating the latest technologies such as USB 3.0 ports but yet offering at this affordable price level, RAIDMAX once again proves itself an excellent price-performance PC chassis professional. 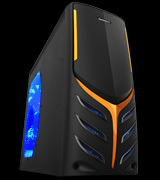 VIPER's stylish design exudes cool power and makes building or modifying your own PC a breeze. There's nothing else on the market quite like the new VIPER. Simple click-lock technology makes installation of disk drives incredibly easy: no tools required. Drives just slide smoothly into the bay and lock into place. There's no hassle finding the right sized screws or fiddling with dropped screws. The RAIDMAX VIPER provides reliable air flow to prolong the life of your valuable PC components. There are three 120mm fans for maximum thermal efficiency. The optional side window mounted 120mm blue led fan not only keeps your system cool but also looks awesome. The VIPER's advanced cable management and protection features improve airflow and keep your cables clear of fans. Mesh expansion slots provide enhanced cooling for your expensive graphics card and other components. The PC's power supply fits at the bottom of the case to provide rock solid stability and enhanced cooling. A special full-sized PSU fan filter keeps harmful dust out of your system. The filter can be taken out in seconds for cleaning – without opening the case. Front panel audio and USB ports provide easy access for your peripherals and media devices, but can be hidden when not in use. RAIDMAX's VIPER future proofs your PC investment with almost limitless expandability and an upgrade path for any scenario. There are 9 drive bays, including 5 external, and space for 7 expansion cards. VIPER's tower format can house full-sized industry standard ATX or Micro ATX motherboards up to 10” x 12”. There are even three back panel tube outlets to make advanced water cooling installation easy. The new VIPER from RAIDMAX offers stunning design, unsurpassed ease-of-use, and an awesome set of features. RAIDMAX raises the bar in PC case design yet again.